This page contains the informations about how to use and install of the Epson AcuLaser CX21NF Drivers and software. Epson AcuLaser CX21NF Driver and software downloads for Microsoft Windows and Macintosh Operating Systems. How to install driver for Epson AcuLaser CX21NF Printer? 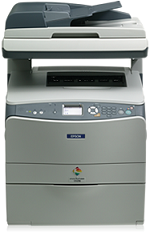 User’s Guide: This Epson AcuLaser CX21NF Manual for more information about the printer. How to install driver: To install an Epson AcuLaser CX21NF driver, navigate to the location (download) of its file, double-click it, and follow the on-screen instructions. Epson CX21NF Scan Software – Download (11.79MB) or Download for Mac OS X (26.17MB). The Epson AcuLaser CX21NF printer driver lets you choose from a wide variety of settings to get the best printing results. The status monitor and the printer utilities help you check the printer and keep it in top operating condition.